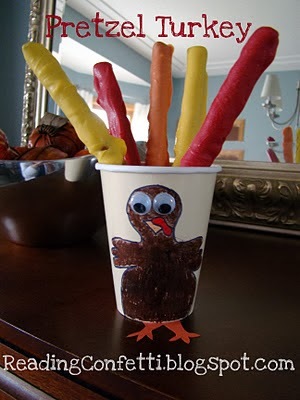 When I was looking through Google images to see if there was anything like Beth's chocolate dipped Turkey pretzel pops, I stumbled across another fun turkey themed pretzel idea. These turkey pretzels would be easy for kids to make and make a fun addition to the kids table. You can check out how to make these turkey pretzel cups over at Reading Confetti.